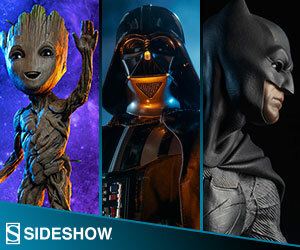 Sideshow has announced some new statues, Aquaman, Mera and Black Manta. He’s the King of Atlantis, possesses superhuman strength, and a founding member of the Justice League. Now, he has come to the surface to grace the silver screen. This statue puts Aquaman at the ready and is highly detailed to resemble his big screen counterpart, Jason Momoa. Based on the Aquaman movie, this highly detailed statue captures phenomenal likeness to the character from the film as well as the action and thrills from the big screen. The better half of the strong Aquaman duo is represented with style in this 12″ statue of the beautiful Mera from the highly anticipated upcoming Aquaman Movie. For the first time on the big screen, Black Manta rises from the see as a 12” statue from the highly anticipated upcoming Aquaman Movie. Black Manta is heavily armed with swords, guns, and optic laser blasts.